Using VR to create understanding and empathy with victims of sexual harassment and assault. 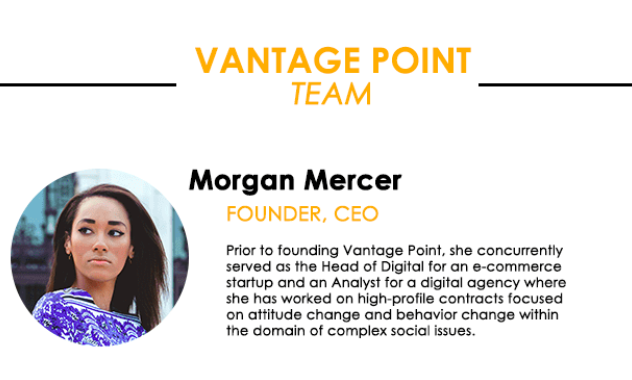 My Interview with Morgan Mercer, CEO of Vantage Point. Morgan Mercer and the team at Vantage Point are looking to eradicate sexual assault and sexual harassment, with the help of virtual reality. The team says that existing educational programs fail in several way to truly help victims of sexual assault and sexual harassment. Morgan Mercer has started a crowdfunding campaign for a virtual reality tool to help people combat the issues of sexual assault and sexual harassment faced by many in campuses and the workplace. After finding out about this project I contacted Morgan to help answer many questions I had. Questions I hoped would help me to have a better understanding and a level of empathy with victims of sexual harassment and assault? Please support Morgan's project and check out the interview I did with Morgan below with my Questions in bold. situations that are tough for both sides. How does Vantage Point help create an understanding and a level of empathy with victims of sexual harassment and assault? ● Last November, in Monaco, I sat at a speaker dinner after a TED event. The men and women were remarking on how most people truly don’t know how to respond if somebody comes out and says “this happened to me”. It’s not that friends, colleagues, and family members have malicious intent and want to respond negatively - it’s just that often times, most friends, colleagues, and family members don’t know how to respond and how to be supportive. We need to better train users on the emotional and psychological impacts assault and harassment can have, and on how we can be better and more supportive communities that know how to respond when victims find the courage to speak out. Why is Vantage Point needed now and why is VR the platform you chose? training and educational programs are conducted in VR. post by vilifying the accusers and saying what he did was not harassment. Scobel went as far as saying that the accusers were jumping on the bandwagon. What are your feelings on this? What is the definition of sexual harassment? statements or to take a degrading stance towards an individual with sexual undertones. context of the relationship (boss, employee), or power relative to the situation. Why are these assaults many times viewed as accidents and things like party culture and alcohol used as excuses? save the person, more so in the sense of needing to be able to process it for yourself. the subset of people who assaulted and harassed you. out for one another even in the event that alcohol is present. Let’s teach people consent. Many times it seems like men are not vocal enough to help prevent situations. Danny Bitman formally of Upload said he only recently addressed the sexual harassment situation that happened there due to not wanting to percieved as not "one of the boys" during his time at Upload. Though he eventually spoke out against Upload can you speak on this "one of the boys" mentality that exists? and firms with scandals similar to this one. You state on the crowdfunding page that Vantage Point is working to create attitudinal change and re-shape existing biases. In your view what are these existing biases? assaulted? Do you know how to best respond? Probably not. What are core user groups Vantage Point will help? better understanding of the role the individual has on changing the overall landscape. How will Vantage Point help teams to prevent issues from ever happening? building more empathetic communities, and increasing the individual’s awareness of his or her role in changing the narrative and landscape. First and foremost, we hope that users will walk away from our program with consciousness in decision making when related to the lasting impact a joke or an action can have (through survivor narratives and creating an individual connection to the global narrative). Second, we will help users to understand that responsibility must be accounted for both as an individual and at a social level - and that holding each other accountable is truly the only way we can change and prevent this issue. Third, we will help users understand how to support one another most effectively, given a series of situations that may and commonly do arise. Fourth, we will train users on responding with empathy - which empowers communities and teams who otherwise might want to be supportive and likely just don’t know how, to know how to best provide support for victims (verbal support, intervention, and reporting). We’re empowering users with the knowledge necessary to know how to respond, how to report, what’s not appropriate behavior; we’re equipping communities with the knowledge necessary to identify how to play an active rather than a passive role in changing the landscape - and how to do it safely; we’re equipping communities with a better sense of empathy and understanding around the topic. Through this comprehensive educational approach that relies on empathy, education, and thus greater responsibility, we should be able to prevent issues from ever occurring. We want a universal understanding that harassment and assault should not occur, rather than this sort of universal understanding that harassment and assault should or would not be reported if it occurs. many individuals who would want to report but can’t afford legal support and don’t know where to find affordable services without potentially risking her or his job. Aside from education and training, we want to be able to help communities with this and provide financial support and connection to support services to help address secondary and tertiary issues that arise surrounding harassment and assault. How can the media help to solve these issues? Please support Vantage Point's mission by helping their crowdfunding campaign.